Picture caption left to right: Robin Chaplin, May Gurney supervisor, Jeremy Clarkson Top Gear presenter and Mitch Good, May Gurney’s reactive maintenance manager. 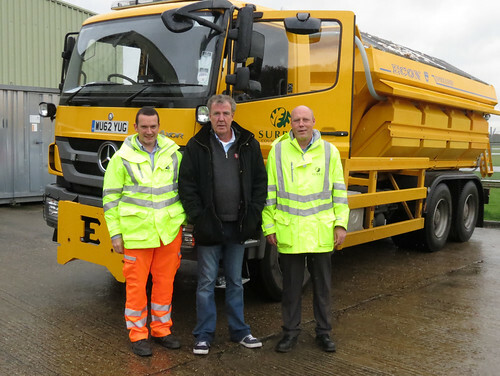 Top Gear’s Jeremy Clarkson experienced first hand the county council’s efforts to keep Surrey moving during winter weather on Sunday night’s show. The presenter was road testing a car he had designed and built himself when he drove up behind a gritting lorry operated by the council’s contractor May Gurney. John Furey, Surrey County Council’s Cabinet Member for Transport and Environment : “I’m pleased Jeremy got the chance to see a small part of Surrey’s winter operation in action. Our gritter drivers worked around the clock during the recent bout of snow and ice to make the roads as safe as possible.